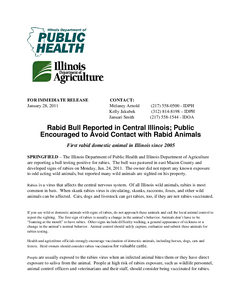 Description: The Illinois Department of Public Health and Illinois Department of Agriculture are reporting a bull testing positive for rabies. The bull was pastured in east Macon County and developed signs of rabies on Monday, Jan. 24, 2011. 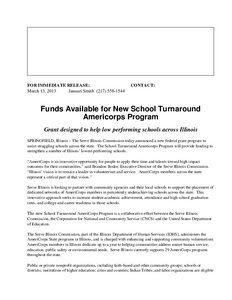 The owner did not report any known exposure to odd acting wild animals, but reported many wild animals are sighted on his property. 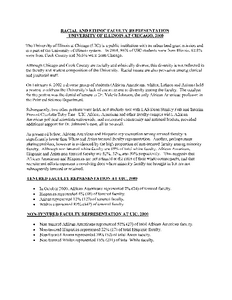 Description: Testimony from the University of Illinois at Chicago for the Illinois Board of Higher Education concerning the Study on Faculty Diversity. Uses the example of denial of tenure to Dr. Valerie Johnson to illustrate the campus climate. 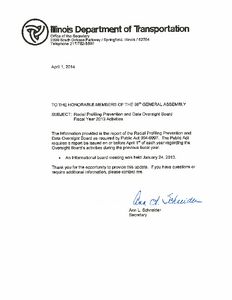 Description: Report of the Racial Profiling Prevention and Data Oversight Board as required by Public Act 094-0997 requiring a report be issued on or before April 1st of each year regarding the Oversight Board's activities during the previous fiscal year. 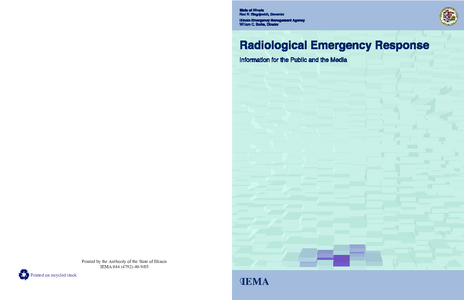 Description: Information booklet for the public and the media concerning the plans and preparedness of the Illinois Emergency Management Agency in the case of an emergency involving radiation. Description: Nearly 40 public health officials, contractors, extension educators and other radon partners are attending a day-long meeting in Springfield Tuesday to learn how they can increase public awareness about radon. 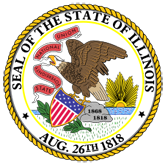 Description: Public health officials, contractors, extension educators and others who deal with radon public education, measurement or reduction are in Springfield Thursday for the Illinois Emergency Management Agencys (IEMA) 9th Annual Radon Networking Day. The day-long event offers presentations on research into the radioactive gas found in nearly 40 percent of Illinois homes, as well as discussions on how to increase public awareness of radon hazards. Description: Press Release: Rags of Honor, the Chicago-based non-profit company committed to employing improving the lives of homeless veterans, was honored as the Illinois Veteran Business Partner of the Year today as part of the Veterans Day events at the Illinois State Fair, with Governor Bruce Rauner and Illinois Department of Veterans Affairs Director Erica L. Jeffries presenting the award. 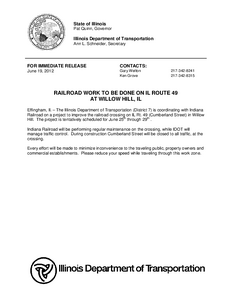 Description: Omer Osman, District 9 Engineer for the Illinois Department of Transportation announced today that an Illinois Central Railroad work crew will be making repairs to the crossing on eastbound IL Route 13 in Carbondale on Wednesday January 4th. The road will be reduced to one lane beginning at 9:00 a.m. 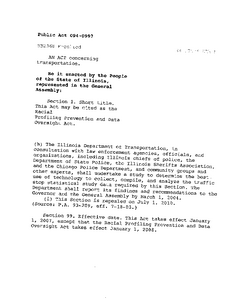 Description: The Illinois Department of Transportation (District 7) is coordinating with Indiana Railroad on a project to improve the railroad crossing on IL Rt. 49 (Cumberland Street) in Willow Hill. 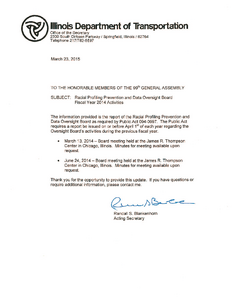 The project is tentatively scheduled for June 25th through 29th . Description: The Illinois Department of Transportation (District 7) is coordinating with Eastern Illinois Railroad Company on a project to improve the railroad crossing on TR 200N (Lerna Road) southwest of the Village of Lerna. The project is tentatively scheduled for Monday October 8th through Friday October 12th. 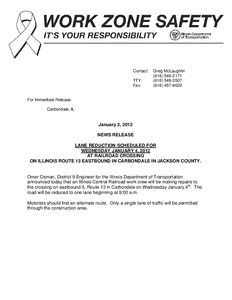 Description: Press release: Firefighters from around the state will join State Fire Marshal Matt Perez to pay tribute to firefighters who have died in the line of duty and recognize 27 other firefighters for acts of bravery within their communities. 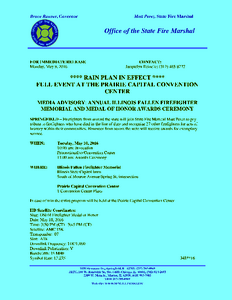 Honorees from across the state will receive awards for exemplary service.